Besides the request of a URL with the browser you also can now display and navigate in the directory structure of the cache archive with the command ls. The abbreviation ls was used used for list by analogy with the corresponding Unix command. and command ls list the directory of the domain. The number of the domains up to which the Full Specified or compact visualization is made out can be set with Options/Navigation. The term Domain is used as short name for Secondary-Level Domain. We otherwise describe this as a Full Specified Domain. At this, we assume per default, the protocol HTTP. The three following functionalities presuppose an activation for the URL History with Options/​Navigation/​URL-History. Online Every visited HTML page. Offline Every not available HTML page in offline modus. File Not Found Every not available HTML page in online modus. The select archives are searched for the entered text. The directory to be shown can be reduced with the filter. The filter affects the secondary-level and top-level domain. According to the list of the available first characters. (Secondary-Level) Domains delimit by input of character. Display limits on domains which … with the string. The list of the Domains and the number which fulfills the choice criterion is displayed. 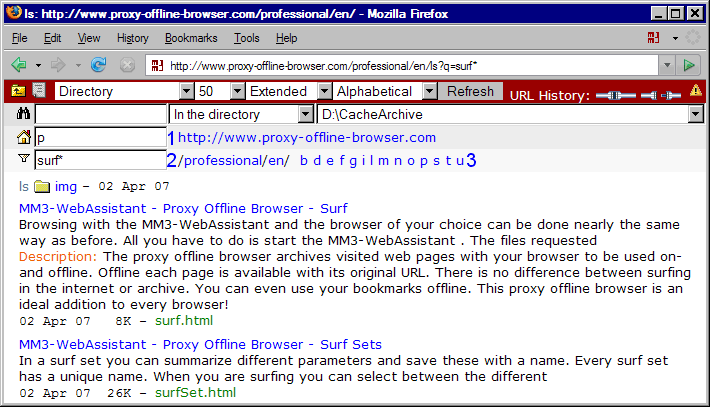 The number of the available domains in the surf set is also displayed. The number of the domains as tool-tip is indicated in the list of the available first letters. Displays the sub directory. Please, notice the notation for the called URL. Display the homepage of the domain. Indicator for an available HTML page in the domain. A click on the indicator displays a HTML page. Displays the home page of the domain. Displays date and time of generation as well as additional information. With the command ls not only all domains can be shown but also all files in a directory. For this case the command /ls is added to directory name. and then other files (not included in the screen shot). The HTML files are listed with their title and description as well as approx. 200 characters text. The number of listed HTML files is configurable with Options/Navigation. Changes into the upper directory. It is displayed in addition that only this Full Specified domain exists. URL is local not available. In the directory and its subdirectories. Number of resources per page. As a simple visualization, however double spaced. The resources can be sorted according to type, size, date and alphabetical. Search with possible limitation to the current directory. By the filter the directory to be displayed is limited. The filter only affects file names. At this we don't distinguish between upper and lower characters. 3 Selection of the first character According to the list of the available first characters. Resources delimit by input of characters. Display limits on resources which … with the string. Download the URL of the directory. Indicator for an available HTML page in the directory.